We are the Hall and Oats of the interwebs. I love this! My brownies are brand new to this and I’m going to make this for them to take home after their first meeting! Thank you! Glad you liked it! I’m going to make another one soon to help our girls prepare for the nature ID competition at our upcoming SU camporee. A great Girl Scout Law coloring book! So helpful! Do you have a PDF of the GS Law? I would love a clear copy for the front of my binder. Just a friendly note. 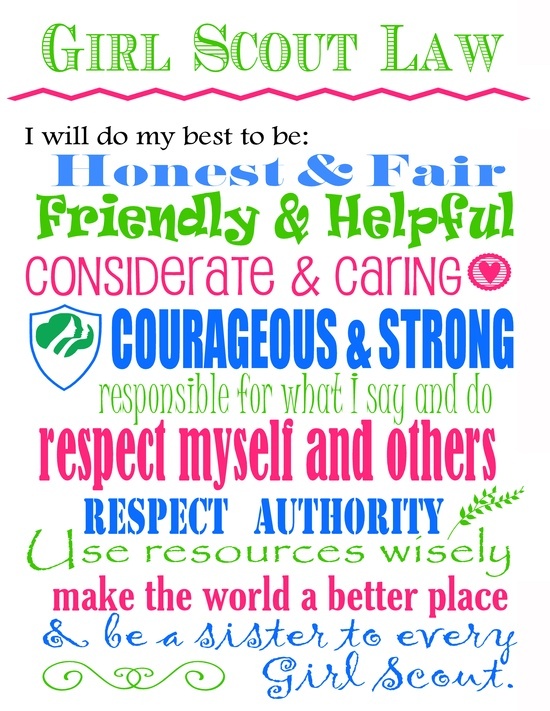 I actually created the colorful PDF for Girl Scouts to use. Please make sure that you give credit where credit is due 🙂 I am sure it was an oversight. Can I print a copy of your Girl Scout Law? Thanks! Am i allowed to reuse this image to put on candles and sell? Is the PDF still available? I tried to open it but wasn’t successful.